An outward display of the high levels of student creativity, achievement and knowledge of students in the fields of science, technology, engineering and math were recently demonstrated at the annual Greenview Invention Convention. Held just before Spring Break, students in Grades 4, 5 and 6 were encouraged to use the five steps of S.T.E.M., which are to Ask, Imagine, Plan, Create and Improve and create projects that described a real-world problem that the invention was designed to solve. Colorful and descriptive display boards were used to share the materials used, instructions for how to use the invention and who the targeted sales market would be for the item. Students also intuitively intertwined quotes and testimonials from mock-users to describe the experience they had in putting their invention to use. Putting on their marketing hats, students were then encouraged to develop a product logo and create an advertising slogan for use. Some examples of the creativity of our students included a magnetic device that allows you to keep your gloves and hat together, so they don’t get lost, head bands with padding to protect the skin and an automatic device for senior citizens to bend down and feed their pets. 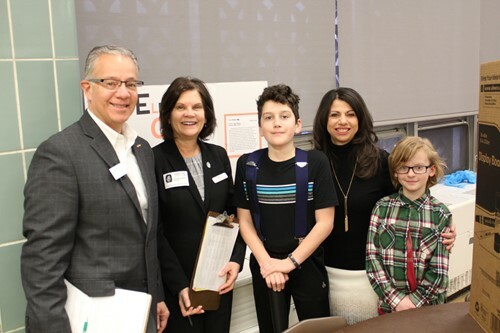 Special thank you to our guest judges who evaluated the various Invention Convention projects, including Mayor Georgine Welo and Mayor Patrick Ward along with other community leaders. Great work to our Greenview Upper Elementary Students!